Just Listed :: Beautiful Home in Vinings on the Chattahoochee! Welcome home! You’ll love this beautiful home nestled in the popular Vinings on the Chattahoochee neighborhood. The open floor plan, custom features, and charming character will never go out of style. The close proximity to I-285 and I-75 makes this home convenient to and from any direction. You’ll also have easy access to the highways, byways, and activities that make this location such a well loved destination! Loaded with thoughtful touches, custom features, and a great open floor plan. Kitchen features stainless steel appliances, granite countertops, large island with breakfast bar, pantry, and spacious breakfast area. Family room boasts plenty of natural light and a cozy gas starter fireplace. Master suite is a true retreat including a vaulted ceiling, sitting area, and large walk-in closet. Spa-like master bathroom features a double vanity, garden tub, and separate shower. Two car garage with ample space for storage. Great outdoor space includes a patio overlooking the fully fenced backyard which backs up to greenspace. Wonderful community amenities including a swimming pool, tennis courts, and clubhouse. 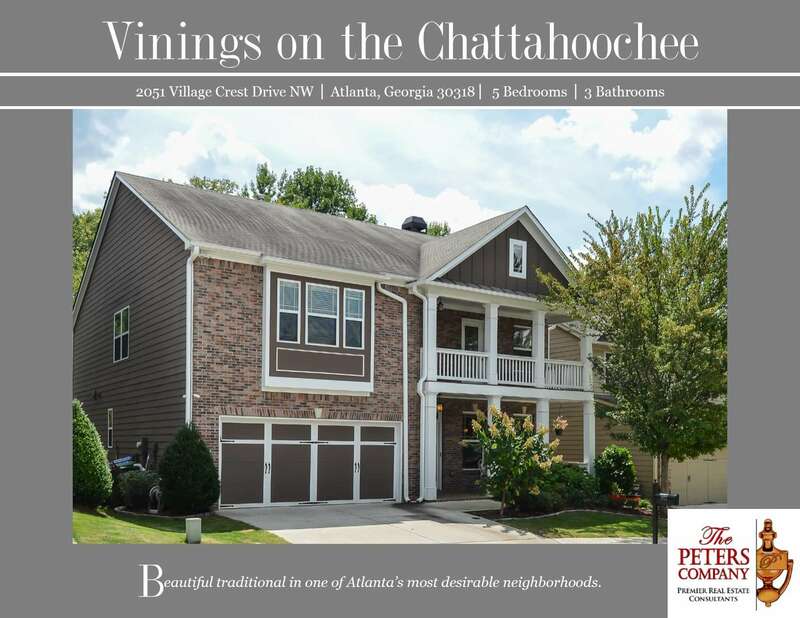 Call The Peters Company today to see this wonderful home at 2051 Village Crest Drive NW… 404-419-3619!